Prime Minister Manmohan Singh’s first comprehensive reshuffle and expansion of his 20-month-old Council of Ministers attempted to address the regional imbalance in his team and take into account the upcoming Assembly polls in five states. 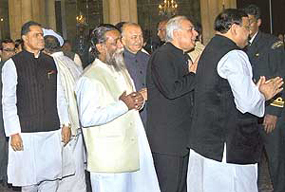 Newly inducted Union Ministers await their turn to meet Congress President Sonia Gandhi and Prime Minister Manmohan Singh after the swearing-in ceremony at Rashtrapati Bhavan in New Delhi on Sunday. Will the new India-Saudi Arabia agreement help the nation? While Congress President Sonia Gandhi hinted at the possibility of some changes in the party organisation in the light of today’s Cabinet expansion, Prime Minister Manmohan Singh parried all questions on the appointment of a full-fledged External Affairs Minister. The first instalment of the readers’ views appears on Forum page. Mahesh Bhupathi captured his 10th Grand Slam title and third mixed doubles crown on the trot after he won the Australian Open title with Switzerland’s Martina Hingis here today.